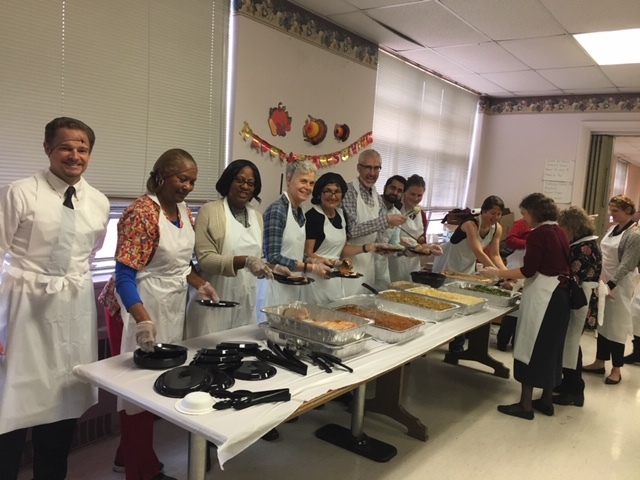 The smiling faces are the staff of the Alameda Health System-Fairmont Hospital Outpatient Behavioral Health Services Program (OBHS) serving patients a Thanksgiving meal. Staff and patients see the program as a mini-community for individuals suffering from a variety of behavioral health issues. Patients who complete the OBHS programs are 90% less likely to be re-hospitalized for a psychiatric emergency. OBHS started in 1999 and it is currently the largest program of its kind in Alameda Country. Patients in this program are referred from AHS and other agencies in the East Bay. The two primary components are the outpatient program which treats about 60 people weekly, including adults, children, adolescents and families dealing with mild to moderate mental illnesses, like depression or anxiety. The day treatment program treats about 250 adults a week for moderate to severe mental illnesses like schizophrenia, schizoaffective, severe bipolar or major depression disorder. PRIME representatives are now looking at the program to help it meets its metrics related to integrating primary care and behavioral health and providing a follow up source of service. By working together, the two departments have an opportunity to increase access to service for lives assigned to AHS and increase quality outcomes. The ultimate goal, internally, is for all OBHS programs to be listed within the new electronic health record system so AHS staff can make direct referrals if a patient needs behavioral health services. “We have two main goals for the patients in our programs, the first one is no hospital readmissions and the second is for them to gain more and more independence each day.” said Maurice Fried, PhD, program manager of OBHS. Treating a behavioral disorder is the same as managing any other chronic illness, you have to take your medication at a regular cadence, exercise, eat right and seek treatment or help when needed. Patients in the programs learn about medication compliance, learn skills to manage their symptoms, have access to doctors and nurses regularly, learn basic life skills, participate in group therapy and partake in other fun activities like Thanksgiving Dinner or Fourth of July barbeques. Once a drug addict and homeless, Chris says, he’s on the path to a better life. The 50-year old was recently diagnosed with schizophrenia and bipolar disorder. In addition to making friends, Chris says the program has been a huge benefit. He admits he was involved in a basic miscommunication a few weeks back and the other person was really upset and became belligerent, but he was able to walk away without incident, a skill he learned in one of his group therapy sessions. “They’ve taught me how to communicate without being aggressive and even how to budget my money.” A skill he is sure will come in handy as he is hoping to move into his own apartment soon. In the program for four months, Debbie hopes to reduce her medications below her current 11 prescriptions. She feels like the people in the program with her are her brothers and sisters and even her biological family has noticed a positive change in her behavior since she started the program. Evelyn is in the program under advisement of her case manager and approved by a judge. She lives in housing with other women and she said a misunderstanding resulted in a physical altercation that led to her arrest. “This program gives me something positive to do with my time. I am so glad Mr. Jonathan let me in, I know my behavior has improved,” said Evelyn. Evelyn suffers from a head injury and says her group sessions are eye opening as she is constantly learning about herself. “I wish people with behavioral health issues knew about all of the services available to them. One of the initial things we do is evaluate their meds so people won’t feel drugged and sleepy. A lot of patients have given up and we try to instill hope and have many success stories,” said Fried. After patients finished with their holiday meal, they all gathered in their gratitude circle to give thanks.